Pressing buttons is often irrepressible. You can’t help yourself when you see one just asking to be touched. 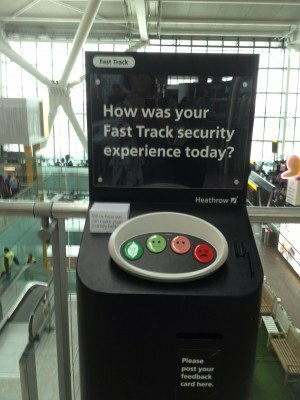 The other day, I was at a meeting where someone proudly proclaimed how they love to push the green button when going through fast track security because it gives them a great sense of satisfaction. The physicality of pressing down on something makes them feel good – like a high five. And, conversely, if they have been subjected to a slow ordeal through security they equally enjoy slapping the red button, helping to relieve their frustration. Buttons are becoming more ubiquitous in other contexts, especially, it seems, those designed to expedite service. Getting someone’s attention can be a trying experience, especially in cafés where waiters are often surly and go out of their way to be unhelpful. Imagine my delight when I saw this call button at Searcys Champagne Bar at St Pancras Station – inviting the customers to press for more champagne. The bar claims to be the longest in Europe and so it saves the waiters having to walk up and down all the time so that you can catch their eye. There is something rather alluring about seeing a sign next to a button saying ‘press for champagne’ rather than the more impersonal ‘press for service’. Trouble is when I last visited it with a friend it did not work. We pressed it and waited five minutes. No waiter. We pressed it twice more and still no waiter. There was no way of knowing if the thing worked as it did not give any feedback after being pressed. Eventually, after 20 minutes a waiter sauntered past, oblivious to being summoned by the button, and so we resorted to the usual, grabbing his attention by shouting and raising our arms. 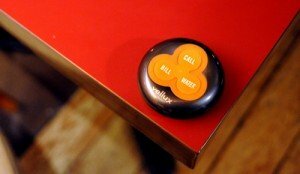 The second call button I came across the other week was in a rather ordinary hotel in the centre of Madrid. The push buttons were encased in a plastic base – located on each table in the foyer/café. At first, I thought they were decorative paperweights but then I realized they were service call devices, comprising three buttons; call waiter, ask for the bill or cancel call. It was only when I looked at a sign at the bar providing an explanation I worked it out. Being mischievous, I was tempted to press all three and run away. Like playing Knock Down Ginger. But then I thought better of it. Instead, I gingerly pressed the icon that looks like a man about to shoot himself in the head (it is meant to be a waiter holding a tray up high). I waited. But it was the same as at the Champagne Bar. No response. After five minutes and still no sign of a waiter I pressed it again. Eventually a waiter did appear from behind a closed door and I hailed her over with my arm. It seems, in both cases, the waiters were ignoring the new-fangled technology (or had switched it off). I don’t blame them – being beckoned by the tyranny of a button is surely very demeaning. And yet, flight attendants would lose their job if they did not attend to the call buttons pressed throughout a flight. However, many of us don’t dare use them. The one time I did press it to get some water, the attendant gave me that look that puts you in your place, masked by the ‘have a nice day’ smile. There is something in a glance that speaks volumes. It is rare now to see passengers pressing the call button. Instead, most of us will walk up the aisle to the galley and ask for what we want. Why is that pressing buttons to get someone’s attention feels awkward? 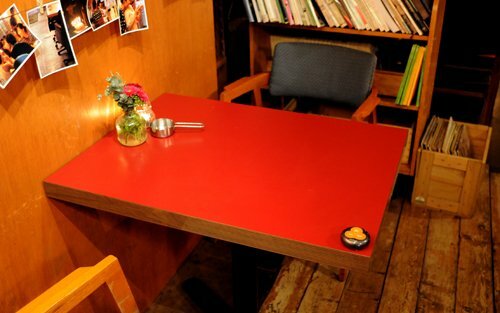 After all, this uneasiness and not knowing does not happen in Korea – where restaurant table calling buttons are an integral part of the culture. Everyone simply presses the discrete button, placed at the end of each dining table when wanting waiter service – without giving it a moment’s thought. What’s more, a waiter will invariably arrive in seconds and seem only to pleased to serve.